By Monica Cacho-Bevin. It was a grey, muggy morning, but the year 6’s from Reignier school were buzzing like bee’s because they were going on camp! It. 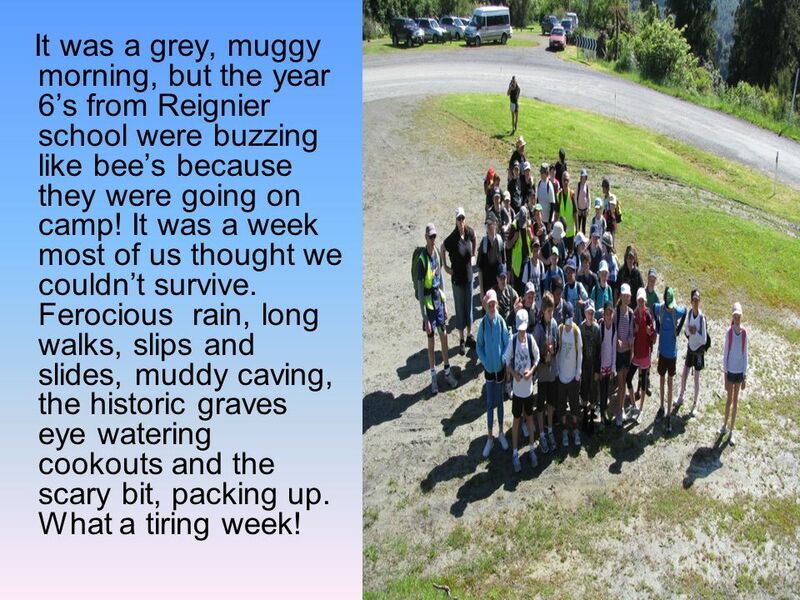 2 It was a grey, muggy morning, but the year 6’s from Reignier school were buzzing like bee’s because they were going on camp! It was a week most of us thought we couldn’t survive. Ferocious rain, long walks, slips and slides, muddy caving, the historic graves eye watering cookouts and the scary bit, packing up. What a tiring week! 3 The horror movie began. We had to unpack ALL the suitcases and bags, in the not so nice rain! We grabbed our bags and ran into the shelter of our new cosy, warm room. 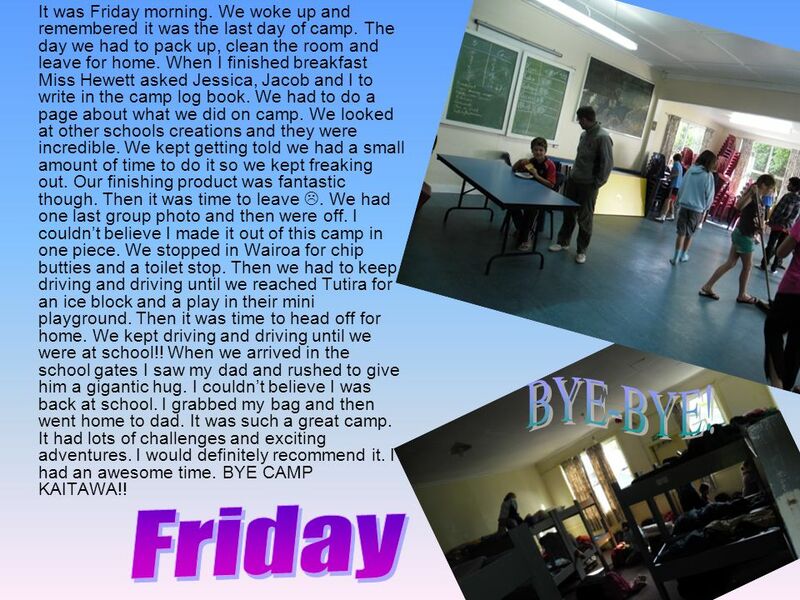 Once we had unpacked our sleeping bags, we played some games then went to the common room to find out we were going on a nice ‘little’ tour of camp, going to the power station and up the pipeline. ‘Yah.’ It was such a tiring walk. 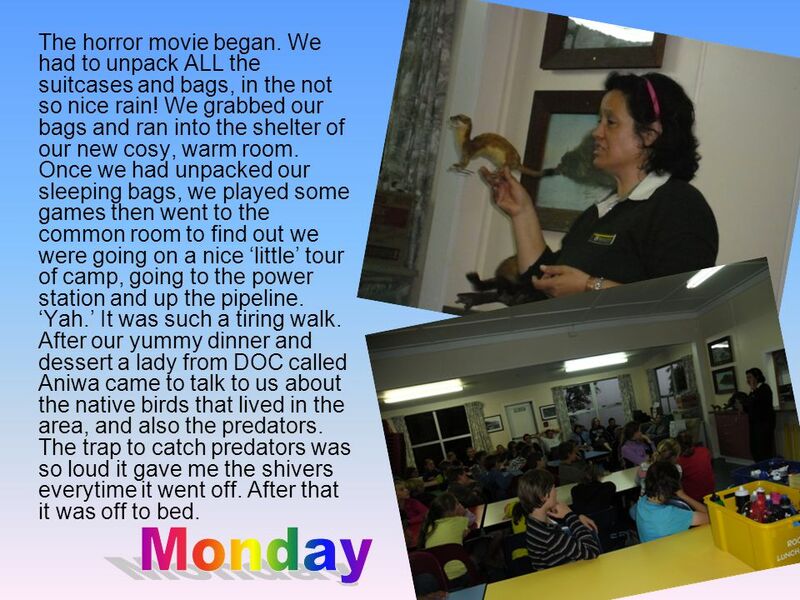 After our yummy dinner and dessert a lady from DOC called Aniwa came to talk to us about the native birds that lived in the area, and also the predators. The trap to catch predators was so loud it gave me the shivers everytime it went off. After that it was off to bed. 4 Rise and shine! It was the day of the big Ngamoko walk. It was a six hour walk! The morning started off with doing our chores. Then it was time for the walk. We drove to the starting point for the Ngamoko walk. We looked up and saw how high we would have to climb. I kept thinking that I wasn’t going to make it out in one piece. 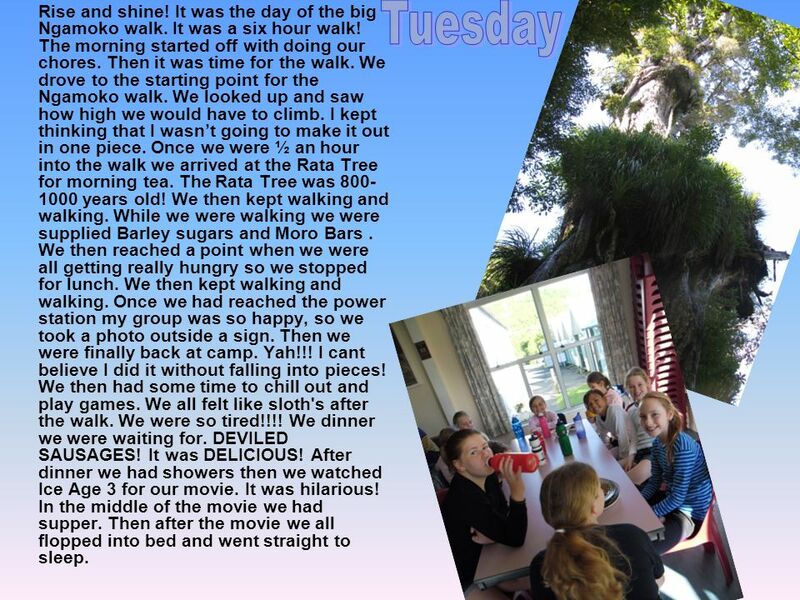 Once we were ½ an hour into the walk we arrived at the Rata Tree for morning tea. The Rata Tree was 800- 1000 years old! We then kept walking and walking. While we were walking we were supplied Barley sugars and Moro Bars. We then reached a point when we were all getting really hungry so we stopped for lunch. We then kept walking and walking. Once we had reached the power station my group was so happy, so we took a photo outside a sign. Then we were finally back at camp. Yah!!! I cant believe I did it without falling into pieces! We then had some time to chill out and play games. We all felt like sloth's after the walk. We were so tired!!!! We dinner we were waiting for. DEVILED SAUSAGES! It was DELICIOUS! After dinner we had showers then we watched Ice Age 3 for our movie. It was hilarious! In the middle of the movie we had supper. Then after the movie we all flopped into bed and went straight to sleep. 5 I woke up to remember today was the day we were going to visit Michael Noonan’s grave and go caving. Yah! I jumped right out of bed and got dressed. I then skipped into the common room for breakfast. After breakfast we got our day packs ready and were off for the redoubt. When we arrived at the redoubt we got into walking straight away. While we were walking we stopped to see the old jail that used to be there. It was a huge rock with carved names in it. The names were carved in by the soldiers that were guarding the jail. We then continued walking until we reached a beautiful place that had a stunning view of the lake. Sophie was taking lots of photos of us and the lake. Then we had to keep walking and walking till we reached a picturesque mini lake. We morning tea there. One by one we went to visit Michael Noonan’s grave. Michael Noonan died while delivering a message from Wairoa to Kaitawa on horse back that the Tuhoi tribe was going to try too attack. He delivered the message though and that’s why he is remembered. We then started talking and had lunch in a hut. Then it was time for caving. The caving was so much fun with all the mud and slips and slides. We ended up going into six muddy, slippery caves. When we got out our shoes were covered with mud. They looked disgusting. Caving was definitely a highlight of camp. Then it was back to camp. We got dressed out of our mucky clothes and into some clean ones. We played some games and then we had showers. If we were in there for too long we would get sprayed by cold water. Luckily that didn’t happen to me. Then it was time for dinner. We had hamburgers. Unfortunately we didn’t get pudding  Then it was quiz night but my group didn’t do that well  it didn’t matter. I just wanted a good night sleep Night-Night. 6 I woke and started stretching my arms. Today was the day of the day of our last walk. I never thought I would be able to do this!! Once we tidied our room and got dressed we headed for the common room to have our last hot breakfast. Looking at the hot breakfast made my mouth water. After breakfast we got our day packs ready and then left for the Papakorito falls. The walk wasn’t that long. The waterfall was breathtaking. One of the rocks had water splashed on it and the sun was shining on it so it looked like silver. While we were walking Miss Hewett was giving our group geography questions. We kept guessing most of the questions. We arrived at a spot where we would have morning tea. It was a little hut. We all found a spot in it and started singing, well, shouting. We then went back the same way and arrived at a big old trailer that we sat on for lunch. Lots of people went toilet because it was the only REAL toilet we had ever been to for a walk that week. We then walked back to the cars. All of us were so happy because it was the last walk we were doing for the rest of the week. A big smile was on my face. When we arrived back at camp we had some free time. Lots of us played UNO or Skip Bo. Most of us then went with Mr Crawford to the confidence course. We had to get our whole team through the obstacle course. They were really cool things you had to get through. The rope we had to walk on really hurt my feet. It felt like wire rubbing against my feet. During the course everyone was laughing and smiling. 7 . Then it was time for something we had all been looking forward to. The Cookout! My group was lucky because we got to have the single fire. We got our kindling and wood and started our fire. We were so surprised because our fire had started! We were all so happy. We thought it would keep going out because of the wind but it didn’t go out which was good. We had to wait for our fire to start heating up, so we went off in our groups to practice for the talent show. We were trying to teach the boys a silly little rap but the boys were acting like they were too cool for the rap! BOYS! Our next challenge was to make a flying machine and we had to be the parts! It was very hard and we didn’t score very high. Next, was the time for the cookout. My group got straight into it. We had some oil in the frying pan so we chucked in our onion and mince. We were doing really well until we started cooking our pasta. The water didn’t boil properly so we had to flag the pasta. Our meal was still DELICOUS! After dinner we roasted marshmallows. It was hard to not burn them. They melted in your mouth like candyfloss. YUM! After that we had Self Saucing chocolate pudding. We had a quiz. That was fun. Then it was time for supper and a good night sleep. 8 It was Friday morning. We woke up and remembered it was the last day of camp. The day we had to pack up, clean the room and leave for home. When I finished breakfast Miss Hewett asked Jessica, Jacob and I to write in the camp log book. 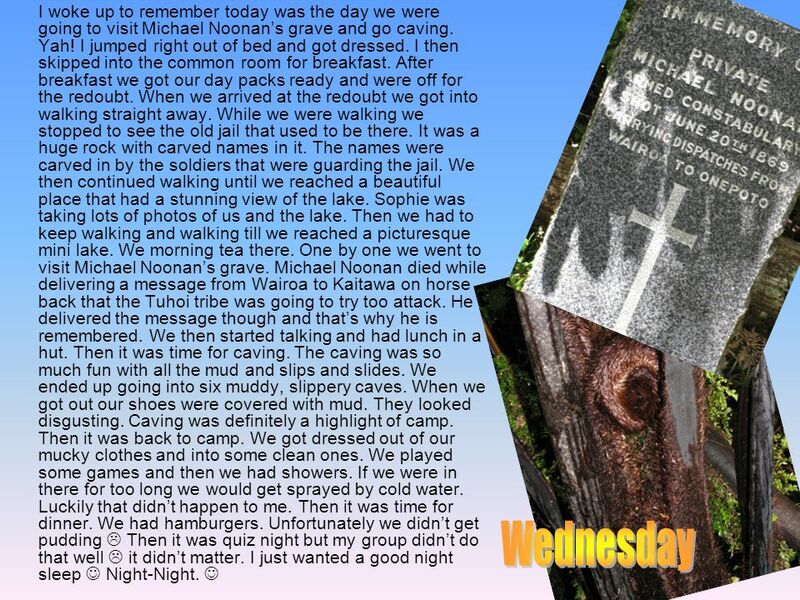 We had to do a page about what we did on camp. We looked at other schools creations and they were incredible. We kept getting told we had a small amount of time to do it so we kept freaking out. Our finishing product was fantastic though. Then it was time to leave . We had one last group photo and then were off. I couldn’t believe I made it out of this camp in one piece. We stopped in Wairoa for chip butties and a toilet stop. Then we had to keep driving and driving until we reached Tutira for an ice block and a play in their mini playground. Then it was time to head off for home. We kept driving and driving until we were at school!! When we arrived in the school gates I saw my dad and rushed to give him a gigantic hug. I couldn’t believe I was back at school. I grabbed my bag and then went home to dad. It was such a great camp. It had lots of challenges and exciting adventures. I would definitely recommend it. I had an awesome time. BYE CAMP KAITAWA!! Download ppt "By Monica Cacho-Bevin. It was a grey, muggy morning, but the year 6’s from Reignier school were buzzing like bee’s because they were going on camp! It." The Wicked Shoes By Storm Phillips The Wicked Shoes By Storm Phillips. Science Writing P.E Reading Art Camp 2010 Cross Country 2010 I am learning to…BeginnerAmateurExpert … look after my body when training for long distance. 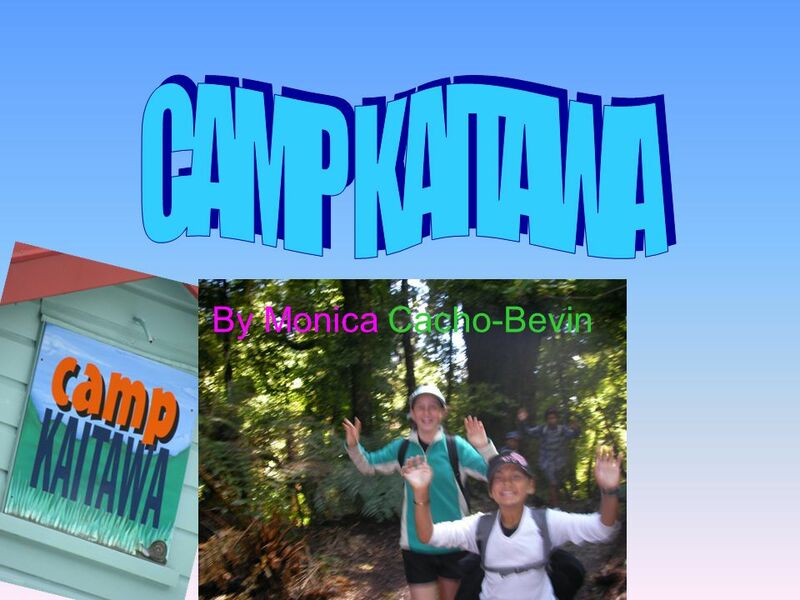 Camp KaitawaCamp Kaitawa By Sophie St Clair Yr 6 Camp. By Katie White. Please enjoy watching my slideshow. Camp Kaitawa By Danielle. Interesting Introduction OMG! The awesome Year 5’s of Reignier Catholic School were exploding with emotions as we started the. Camp Kaitawa By Charlotte Etheridge. I left home with butterflies in my stomach! I know there was no reason to be nervous but I just couldn’t help it. It was a yuck, horrible morning, yet all the year 6’s from Reignier School were getting nervous yet excited before we left for Camp Kaitawa. It was a. Camp Kaitawa By Angus Wilton. The morning started with a warm breeze as the Year 5’s headed off to Camp. Little did they now about the amazing adventures.